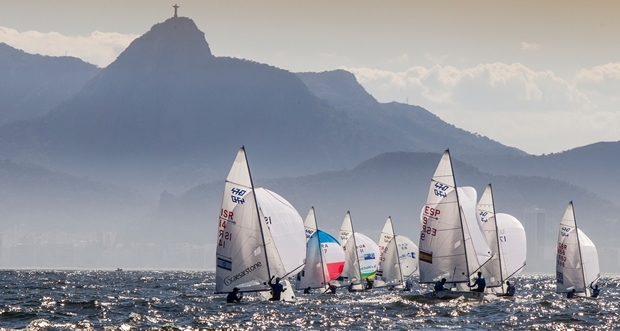 Rio de Janeiro's Olympic waters were packed full of exceptional sailing and athletic talent on Sunday 16 August with all ten Olympic events on show at the Aquece Rio – International Sailing Regatta 2015. Mat Belcher and Will Ryan (AUS) lead the way in the men's and are followed by Stu McNay and Dave Hughes (USA). After racing Hughes commented on the course, "The entire fleet hasn't done a great deal of training on the course. Historically we have all focused on Niteroi and Copacabana so it was a balance of trying to take the lessons of those two courses and see what was applied and make some adjustments. In the Women's fleet Shasha Chen and Haiyan Gao (CHN) and Anne Haeger and Briana Provancha (USA) share the lead. The conditions suited the teams with light frames and the Chinese and Americans capitalised. Pieter-Jan Postma (NED) had a great day in the Finn, picking up a second and a first. The Dutch sailor holds the early advantage and was pleased with how things played out, "I had a very good start and great strategy. "I tacked off all the way to the right and there was a bit more pressure there and then to the mark, fourth at the top mark and then I caught up to second. Uno, due, tre. One, two, three. Um, dois, tres. Whatever the language, the score cannot be faulted as Italy's Giulia Conti and Francesca Clapcich came out hard in the 49erFX to set a good benchmark. An opening race first was backed up with a second and then a third as they took the early lead and Conti was happy her pre-race planning paid off, "We went out with some strategy already as the pattern of the wind looks like it is the same every day and we talked with our coach about what to do. The Men's and Women's RS:X fleets enjoyed another excellent day on the water racing under Sugarloaf Mountain with a beach full of Carioca's enjoying Rio's sunshine and the great race action. Aichen Wang (CHN) continued his good form in the opening race by taking the victory, but it didn't come easily with a number of his rivals just inches and seconds behind him. On the run to the finish Byron Kokkalanis (GRE) was hot on Wang's heels. Wang held firm to take the narrowest of wins. Consistency pays off in sailing; it's the nature of the game. Across a large number of races in a range of conditions gold medals have been won by sailors who lacked a race win to their score card. The Women's RS:X fleet saw exceptional performances from Malgorzata Bialecka (POL) and Blanca Manchon (ESP) who finished in the top eight in all three races. Across the six race series neither sailor counts a bullet but their consistency sees them placed second and third respectively. France's Charline Picon had a mixed day with a race win, a second and a discarded 11th. She leads the way by one point over Bialecka. The star of the show in the Women's RS:X was Estonia's Ingrid Puusta who recorded a race win and two thirds to catapult her up the leaderboard. She sits fourth overall. Croatia's Tonci Stipanovic was full of smiles after racing in the Laser following a race win and a second. Stipanovic had a mixed opening day with a first and a 14th but bounced back by doing what he know best, sailing hard, sailing fast and at the front of the pack. For Van Acker, Rio's challenge is an exciting proposition as the fleet moved outside of Guanabara Bay on the Niteroi course. "Every course here is different,” said Van Acker. "Inside the bay is flat and outside is bigger waves, but this way on different courses the best all round sailor can win it.